LogMeOnce Password Manager Review 2019 – Worth A Try? LogMeOnce is the Gold Standard. LogMeOnce is an excellent password manager with multiple powerful features. It applies Anti-Theft, Mobile MDM, Password Dialer, Kill-Pill, smart Menu, Anti-Lock, Selfie-2FA, Secure Wallet, Secure Note, LogMeOnce Mugshot and more. LogMeOnce will protect your passwords no matter where you go. Its password manager has multiple login options including PhotoLogin, Fingerprint, PIN code and Password. Only LogMeOnce offers a comprehensive number of login options with automatic 2FA. You always get the extra security layer of 2FA without the hassle of typing yet another password, SMS code, or a 2FA token. You get instant protection and instant access to your computer via your mobile device. Therefore, you can access your account by logging in with your trusted mobile device. No worries about keyloggers taking advantage of weak or duplicate passwords. 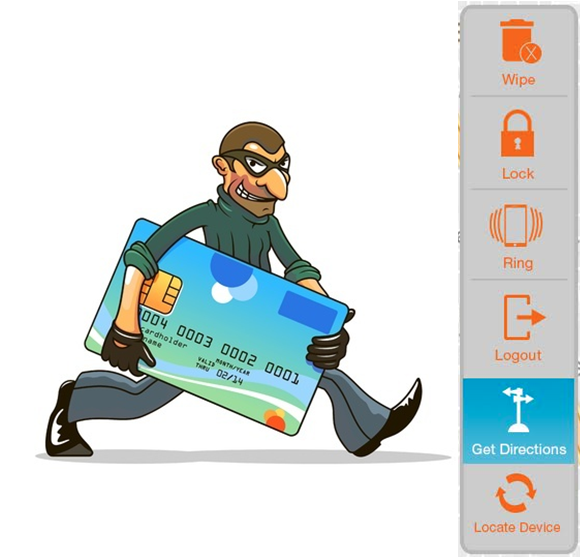 LogMeOnce also has Anti-Theft feature can help you delete all LogMeOnce data if you know your device is stolen, or you can remotely lock your device by forcing a password, or remotely log out of your device, and instantly protect your data. With LogMeOnce, you can securely give the right individuals (employees, customers & partners) the right access to apps, devices and critical business information at the right time. LogmeOnce reduces costs, increases productivity and efficiency, all while securing your IT environment. Get LogMeOnce – It’s Free! Protect your Credentials. Enjoy secure computing while protecting your passwords and IDs with Military-Grade encryption technology. It’s that simple. Get out-of-the-box integration with popular applications, including Google Apps, Salesforce.com and many more. Simply pick your App from our catalog and you are ready to go. Greater security and speedy implementation means a better return on your investment and a faster time to value. Get out-of-the-box security with LogmeOnce, and protect your passwords. LogmeOnce employs Advanced security encryption technologies such as AES and SHA-512. It is preconfigured and run in the background. You don’t have to do anything! Nobody has access to a user’s password not even LogmeOnce. Your information is kept private because your password and associated information are all encrypted with a unique key. Each user has his or her own access and encryption key, and no one else knows what that key is. LogmeOnce’s employees and servers do not have access to your credentials. With multi-factor authentication, users can build multiple layers of security in order to enhance and secure any access to their data. Check “How LogmeOnce Works” to see how your data is stored and protected. LogmeOnce Password Calculator automatically creates and suggests strong passwords. For example, “four grizzly bears” can be “4 Grizzly Bears!” which takes six quadrillion years to be cracked. Do you really think that a hacker would now even bother or would be interested in a password that takes about 6,000,000,000,000,000 years to be cracked? Most probably they would move on to a much easier target. Yes. LogmeOnce suite provides secure access at anytime, anywhere, on any device using Secure Amazon Cloud. User credentials, which are encrypted on a user’s computer and a user’s browser session, can be accessed securely. These credentials are then deposited and locked into the user’s Cloud Safety Deposit Box with a unique user-selected key. LogmeOnce does not have this (your) key. Yes. LogmeOnce suite protects against Shoulder Surfing. Shoulder Surfing while typing user names and passwords is mildly terrifying and a serious concern. End-users are mostly concerned with malicious observers who may be able to acquire their password credentials by simply watching over their shoulder. With LogmeOnce there is no need to type in passwords to access applications any more. A Simple click on an application icon and you are logged in automatically through LogmeOnce secure and encrypted access management process. Key loggers only get hashed and encrypted package which is worthless for them, as they have to spend year to decrypt it. Yes. LogmeOnce suite includes Cloud Identity Management and relieves the pain that end users face or have by managing multiple passwords for their cloud applications. With LogmeOnce Cloud Identity Management you can enforce own security policy or corporate standards for cloud application access and improves productivity for IT and end users by relieving password reset requests. LogmeOnce Multifactor Authentication Security (MFA) serves a vital function within any household, consumer or business organization -securing access to assets, protecting the identities of users, and ensuring that a user is who he claims to be. With the recent surge in high-profile security breaches, as well as evolving business environments that require entirely new considerations for access control – like SaaS applications and mobile device management – represents a shift in how trust and control is established and maintained. Encryption is the process of transforming plaintext data using a cipher algorithm to make it unreadable to anyone except those possessing special knowledge, usually referred to as encryption key. LogmeOnce employs Advanced security encryption technologies such as AES and SHA-512. 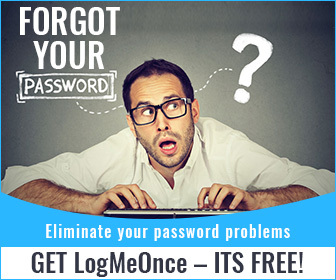 Get out-of-the-box security with LogmeOnce, and protect your passwords. It’s preconfigured and used in the background. You don’t have to do anything! For Firefox users, the information which is displayed in the left hand side column in clear text format is now encrypted as shown below. Why More and More People Choose LogMeOnce Password Manager? LogMeOnce is now trusted and used by more and more people due to its multiple advanced and excellent features and technologies. All these excellent features and security measures add more layer of security for customers. And also customers can enjoy high-grade privacy with LogMeOnce password manager. No theft, hacks or snoopers can steal your passwords or personal data. LogMeOnce develops remarkable features including Anti-Theft, LogmeOnce Mugshot, Selfie-2FA (Two-Factor Authentication), Productivity Dock, Secure Wallet, Visual OTP, Anti-Lock, Emergency Access with Photo, Comprehensive Multi-Factor Authentication (MFA) offerings, Kill-Pill, Fingerprint Biometrics, Secure Note, Single Sign On (SSO) and Federated Identity, Live Password Tracker and more. Wipe: Delete all LogMeOnce data, if you know the device is stolen. Lock: Remotely lock your device by forcing a password. Ring: Get the phone to ring at top volume, for an easy find. Display message: On your phone, display a message and help finder to get your device back to you. 2. Anti-Lock: Avoid getting locked out! Don’t fear getting shut out of your own account. LogMeOnce Anti-Lock is our account safety system for users’ proper and secure access. Enforcing account security is critical, but avoiding lock-outs is equally important. PasswordLess Access: Great benefits come with this feature. By pairing a mobile phone, you get PasswordLess access, which is far more secure than entering a lone password. Duplicate Key: Once paired, your trusted mobile device will also grant access back to your account in case you get locked out of your PC for any reason. Anti-Lock is a preventive measure. Your mobile device works as an account recovery tool. Login to desktop accounts is approved via mobile device. You can pair/add as many mobile devices as you would like to your account. The more, the merrier. Snap your hacker’s photo! Find out who may be trying to break into your LogmeOnce account through your various devices. And detect break-ins to your Android. LogmeOnce Mugshot detects unauthorized and fake entries for fingerprints, Touch ID, passcodes, and passwords! When a wrong password is submitted to LogmeOnce, we immediately snap a photo of the intruder via your front-facing camera. We take photos via laptop login or webcams too. Hackers don’t know your password! But we know how to catch them in the act. Mugshot is seamlessly integrated with LogmeOnce Password Manager. Mugshot snaps your hacker’s photo, video, audio, GPS location, map, and IP address. LogMeOnce provides you with a dedicated and secure web portal account. Log in to see a wealth of information collected any time a wrong password is submitted by a hacker, intruder, or a disgruntled colleague. The hacker’s photo and pertinent information, such as the IP address where the attempt was made, GPS location, and time stamps, are put in one place for your reference. And the data is also emailed to you in the background! Mugshot expands your protection by taking more pictures of your intruders’ surroundings with the phone’s rear-facing camera. You can also set it up to record their voice audio and video while they try to break in to your account. Listen to them fumble and get frustrated as they type in the wrong passwords and get denied. And be satisfied that you have caught them in the act — and stopped them from taking your data and identity. Selfie-2FA is one of LogMeOnce newest Two-Factor Authentication methodologies. The patent pending Selfie-2FA is superbly unique as an actual image, photo, or picture of an object is delivered for the 2nd factor of authentication. Unlike traditional 2FA products that use a “One Time Token” and string of digit for a 2nd factor, Selfie-2FA use of an authentic image greatly adds to processing of secure credentials. It’s fun and easy to use. Productivity dock is engineered to take full advantage of feature-rich LogMeOnce, provides you quick access, and lets you launch your favorite apps with a click. Securely store private information with LogmeOnce Secure Notes. It will be encrypted locally on your system. It’s like a password-protected digital notepad that you create, edit and can even color for easy distinction and search. And you may access it anywhere, anytime. Securely save any data such as driver’s license info, credit card data, birth dates, passport numbers, bank account numbers, and Social Security numbers. LogmeOnce encrypts data locally on your computer with AES and the password that only you know. Stuck in a bind? If you get caught in an emergency situation while away from your computer, you can ask a trusted friend to help you — and grant them immediate access. With LogMeOnce’s unrivaled Emergency Access feature, you can see and verify the person’s photo, GPS location, and metadata before granting access. It’s easy for both of you — and safe. Since your access code is concealed, the trusted friend never has to know your master password. How it works: You will receive the trusted party’s request on your mobile device along with their photo and where they’re located. If no webcam is available, you get a Visual OTP to validate the request. Click to approve, and they have access for up to 24 hours. You can revoke access at any time. 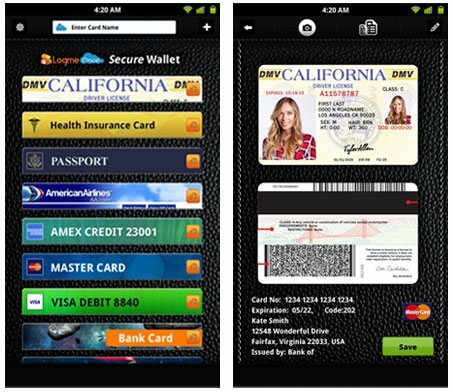 LogMeOnce’s patented technology is intelligent and offers multiple ways to protect your credentials. No Webcam? No Worries! If your computer doesn’t have a webcam or it’s not working, you can still benefit from PhotoLogin and authenticate yourself with a genuine image right from your own desktop. 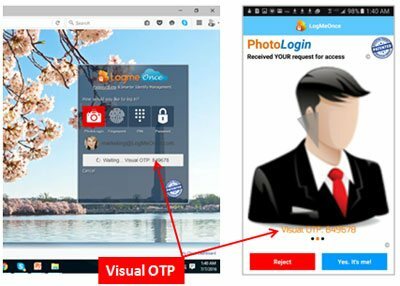 Visual OTP is an unrivaled new feature of LogMeOnce. LogMeOnce PhotoLogin patented and patent-pending technology gives you the power by taking an instant photo of one moment in time. Your authentication factor can change in a millisecond, whether you’re showing off your cufflinks or holding a stapler. How could hackers possibly know how you will pose or what you will be wearing to log in? They do not even know your photo’s scene, background, color, wall, windows, or room’s ambiance! 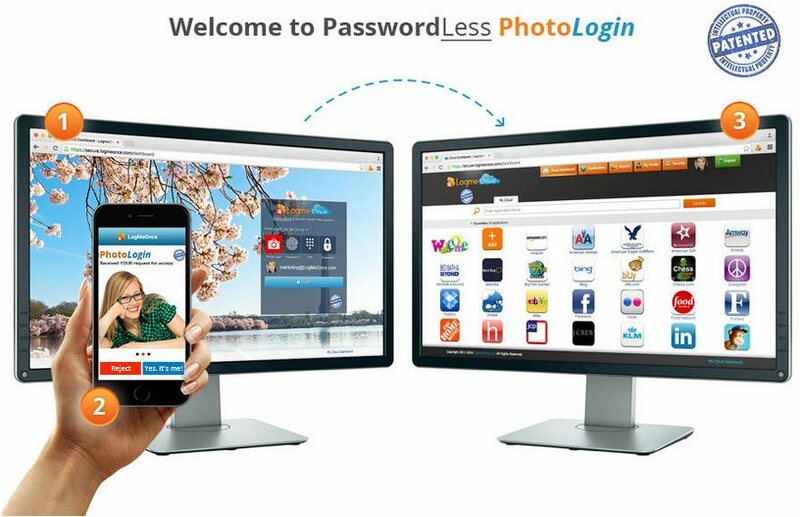 PhotoLogin patented technology enables you to log in to any website without typing a password, or use facial recognition tools. Do you wish to remotely find, lock, unlock, pair and unpair your device? Do you know, what is the state of security and password on your devices? LogMeOnce provides a unified dashboard that displays a user’s entire device. Enforcing devices security for you or your family is critical to build a real security perimeter. You are able to detect compromised devices which is another practical security enabler. With simplified passcode reset you can lock from anywhere, and manage your devices at every stage. LogMeOnce “Device Management” collects pertinent information that will be used to establish security posture and includes; CPU, Device Identifiers, Display, General Information, Network, and Software. One simple dashboard view to see all of your devices of different OS in one screen. LogMeOnce password manager provides free service but you can get high-quality product and service. You can enjoy complete security by using LogMeOnce password manager as it offers the richest selection of 2FA methodologies. With LogMeOnce 2FA you get your own padlock of encryption and lock down your data yourself. And YOU are the ONLY one who has the encryption key. After you login with your first password, a second password will be delivered to you by LogmeOnce via any of the options you choose. LogmeOnce advocates security is a multi-layered approach to build your defenses. Because LogmeOnce doesn’t use third-party USB sticks, our Two-Factor Authentication (2FA), combined with military-grade AES encryption, along with 26-layer encryption method operates entirely within the LogmeOnce system, providing even better protection. Multiple security layers form a comprehensive security umbrella designed for end-user convenience, security and ease of use. Therefore, it is worth having a LogMeOnce password manager to manage and store all your passwords.